John Quinney (No.44 in the list of male British team members) was born on 18th August 1965 in Kent. In 1979 he joined the then flourishing Herne Bay Flyers Roller Speed Club. The club was a breakaway speed faction of the "old" Herne Bay United club, which predominantly concentrated on hockey. It was former British speed Champion, Jim Lipyeat, who had set up the club and was coaching promising youngsters (and later internationals) such as Rohan Harlow, Ian Ashby, David Jackson and his own daughter, Denize Lipyeat. On 29th September 1979, shortly after his 14th birthday, Quinney entered his first race. I was on his home indoor track at the Herne Bay Pier Pavilion, the first day of the popular two day Herne Bay International event. Quinney was making great improvements race on race and almost 12 months on from his first race and just a two days before his 15th birthday he took part in his first British Championships as a junior. In both the 500 metres and 1000 metres Quinney would finish third with both events being won by his team mate, David Jackson. In the same month Quinney was also part of the Junior British Team that was selected to take part in the very first Junior European Championships in Italy (Venice for the track and Finale Emilia for the road). Of the five junior boys who were selected, four of them came from the Herne Bay Flyers club with Adrian Wordsworth (Alexandra Palace) making up the fifth place. Quinney was one of three boys who would skate every distance with the exception of the 10000 metres on both road and track. Back then, the Roller Speed Committee ruled that our juniors were too young to skate in any distance above 5000 metres - a rule that has since been scrapped, thankfully. Quinney's highest placing was 13th in the 500 metres knock-out but this was just the start of his international career. 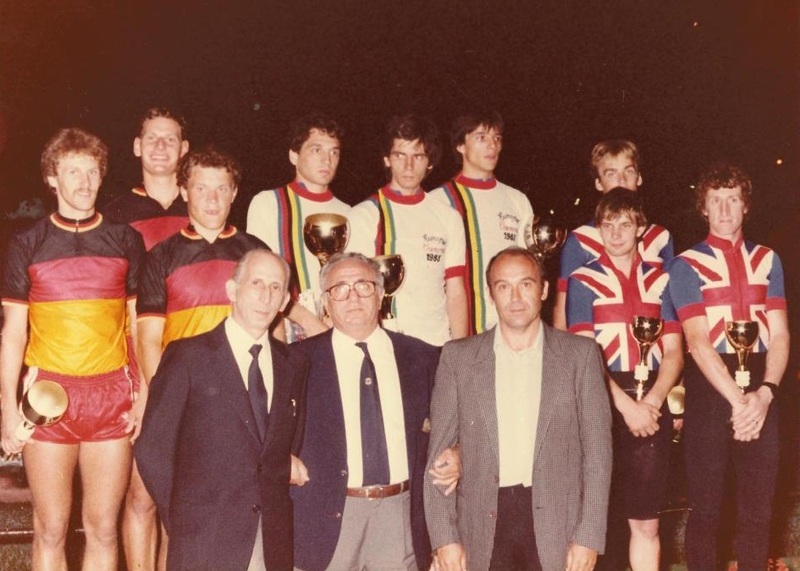 Quinney was consistently in the placings in junior domestic events and when the 1981 British Championships came around in May of that year, he would again find himself on the podium. 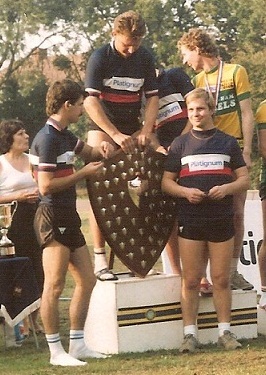 This time it was a silver medal behind another team mate, Rohan Harlow. Unfortunately Quinney was now too old for the Junior European Championships but he now had one eye on the Senior team. The British team was in a state of change in the early 1980's. Pat Feetham had retired in 1980 and John Mullane in 1981. Jerry McGrath and John Downing had made their mark, but Downing had now also retired having had an all too brief, but successful, senior career and McGrath was struggling to find form. The only two pillars of consistency in the senior British team was John E. Fry and Mick McGeough, which left the way for others to try their hand. In 1982 Quinney was now skating at a senior level and was making himself known as one off the "up and coming" youngsters who were giving the old school a run for their money. Together with the likes of David Jackson, Darren Cobley, Lee Macavoy, Rohan Harlow and Ian Ashby, Quinney was amongst British speed skating's very own "brat pack". In June he secured his first senior British Championship medal - a silver in the 20000 metres on Palmer Park, Reading, again behind his team mate Rohan Harlow. This, along with his other domestic performances, earned him a place on the Senior British team for the first time. Between 12th and 28th September he would compete in Italy in both the European (Jesi on the road followed by Santa Maria Nuova on the track) and World (Finale Emilia track) Championships for that year. The European team consisted solely of men. Seven of them to be exact. It was the largest British men's team assembled for a European Championships under the management of Pat Feetham. Alongside Quinney was other new boys Jackson, Harlow and Cobley, along with seasoned veterans Fry and McGeough and new British time trial Champion, Tom Bartlett, in his first appearance for Britain since 1978. At the European Championships most of the individual performances for Quinney and the remainder of the British team were pretty uneventful with not one solitary medal to anyone's name. Despite this, Quinney did come home with the best individual performance with a 4th place on the track in Santa Maria Nuova after having lapped the field with a small group of skaters. Quinney was a likeable guy. He was unassuming and small in stature and had what can only be described as an erratic but somehow effective skating style. He may not have had the silky smooth technique of De Persio or the power of someone like van de Perre, but he was still quick. He was also immediately popular amongst other international skaters and in Santa Maria Nuova the crowd also took him to their hearts. As he lapped the field the crowd began to chant his name. It is almost unheard of for an Italian crowd to chant anyone's name other than one of their own, but Quinney had somehow transcended that. Following on from that race Quinney then helped Britain secure it's only medal with a silver in the relay as he earned himself his first European medal. As the entourage moved on to Finale Emilia for the World Championships, Feetham dropped Harlow and Bartlett leaving just Quinney, Fry, McGeough, Cobley and Jackson in the team. Whilst Jackson would be the fourth man on the road it was Quinney who would be fourth man on the track. In his first World Championship event, the 300 metres time trial, Quinney would finish 18th. It would be his highest position from the three individual events he would compete in. Quinney returned home now knowing what international skating at the highest level was all about. He set about his winter training and prepared himself for the 1983 season. Like the previous year he had featured prominently amongst the top skaters in Britain during the domestic season. In July he took second place in the Southern Counties Championship and went on to secure himself another silver medal in British Championships, this time in the 1500 metres, again behind Rohan Harlow as well as gold in the relay. As September approached the British team for the European Championships in Cremona, Italy was announced, and once again Quinney was named amongst them. The team arrived in Italy and for the first time since European Championships began back in 1935, Britain dispensed with the "all white" race shirt and sported a modern Union Jack emblazoned skinsuit. There was also a dramatic change in the team line up. Feetham was again Team Manager, but this time had decided not to select Mick McGeough. It was the first British team not to feature McGeough since 1968. 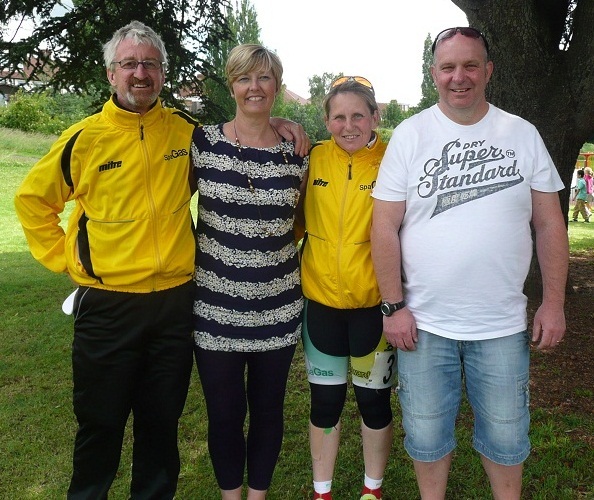 In addition, there was a totally new line up in the women's team with Alison Hartley, Sharon Tongue and Kerry McLaughlan as well as another newcomer to the men's team with Ian Ashby. Ashby was a team mate of both Quinney and Harlow and had recently "unofficially" broken the then World Record for 300 metres. On the track Quinney would compete in five out of the six events and once again have the highest individual placing with 4th in the 10000 metres. (He would take a fall in the 20000 metres - the event of which is described in the "Funny Stories" section of the Forum on this website). In the final track event Quinney, along with Fry and Cobley, also took a bronze medal in the relay. It was Quinney's second European medal in as many years. On the road, he would only skate one individual event but was again selected for the relay, this time with Ashby and Cobley. At some stage through the race all three of the British skaters would take a fall but still managed to finish a close 4th. Like the rest of Britain's top skaters, Quinney was a victim of circumstance when it came to the 1983 World Championships in Mar del Plata, Argentina. He was almost certain of a place on the team, but the events of the Falkland's War 12 months earlier meant that Britain would not send a team for fear of reprisals against the athletes. Unfortunately for Quinney, although he didn't know it at the time, it also meant that he would never again race in a British skinsuit. By the time the 1984 British Championships came around it was announced that there would only be three male skaters selected for the forthcoming World and European Championships in Bogota, Colombia and Vienna, Austria, respectively. Quinney's domestic performances were still good, but despite a bronze in the 1500 metres British Championship and a second relay gold medal, Quinney was left out in favour of Cobley, Harlow and John E. Fry. Although only 19, Quinney was also finding the mix of hard training and the necessity to work difficult to balance. It was the start of a decline in both performances and latterly, appearances, for Quinney that he would not recover from. As the 1985 season started it was all too apparent that Quinney was not the skater he was of just 18 months before. His last individual race was a 5000 metres on the Birmingham Wheels track on 30th June finishing way down the pack Later in the year he would still make up one quarter of the Herne Bay Flyers team that won the British Relay Championship for a third successive time, and a year after that would repeat his cameo relay appearance once more in a Herne Bay shirt to make it four gold medals in a row. But that race really was the end. Just a day before the 17th anniversary of his first ever race, Quinney took part in his last ever race. When he had the relay gold medal hung around his neck on 28th September 1986 Quinney knew it would be the last time he would ever set foot on a track, let alone the top step of the podium. John Quinney was only 21 when he skated his last race, but he was only 18 when he was last considered competitive. He was part of a generation that should have took British skating into a new era of success. In the '40's and '50's there was Denis Hill and Don Brown, whilst the '60's belonged to Danny Kelly, Leo Eason and Les Woodley. Then in the '70's came Fry, McGeough, Feetham and Mullane...all World and European Champions or medallists. But despite the excitement of international performances being put up by the youngsters at the start of the 1980's, McGrath, Downing, Cobley, Quinney, Macavoy, Ashby, Jackson...the list goes on...they all disappeared virtually overnight. It left a yawning chasm between those now considered elite and those considered "also rans" There was no-one on the fringes ready to be developed further and 30 years on, arguably the sport in Britain still suffers as a result. As for John Quinney himself, he went on to be successful in business, the likelihood being that the efforts he put in to achieve the accolades he did in the form of British and European medals, stood him in good stead. These days he rues not continuing and bowing out of the sport at such an early age, but for the briefest of moments his name deservedly belonged on a list of great international athletes and for that alone it now belongs on a page dedicated to a British Skating Legend.